The 36" Sabre HSGM Hot Cut System from KeenCut is a 46.5" silver anodized baseboard with a spring-loaded HSGM heat knife carrier that is mounted on the cutter extrusion bar and has an adjustable bearing and slide system. 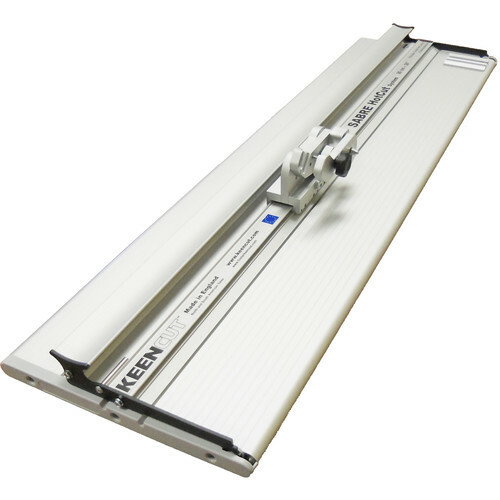 The carrier is compatible with the HSG-0 heat cutting knife, which is used to cut and seal fabrics, belting, and webbing and to provide speed and cutting accuracy not easily achieved by hand. KeenCut recommends using a 1/4"-thick tempered glass because the knife's heat is not transferred to glass, giving a more accurate cut. The included heat-resistant silicone tape is used to hold and keep cutting surfaces from moving while cutting.